Jameson is one of the biggest names in Irish whiskey and it is a smooth, reliable whiskey for cocktails. 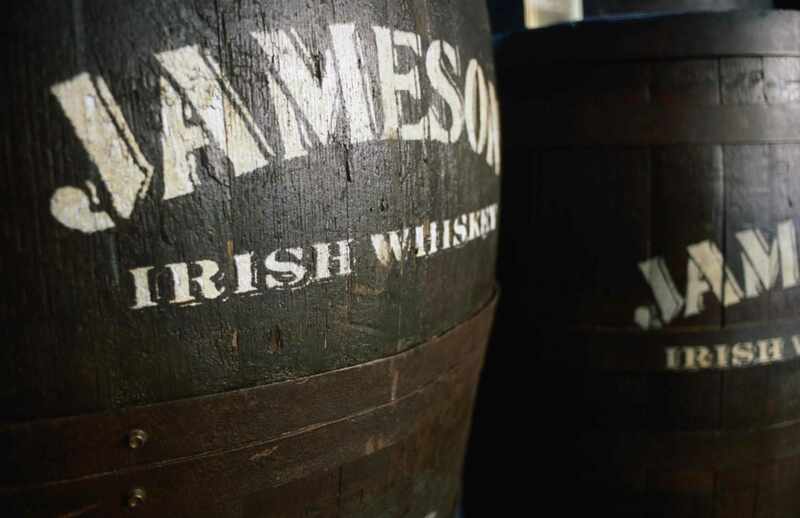 John Jameson started in the 1770s with a dream to break into the booming whiskey business. At that time, Dublin was known for some of the best whiskey in Ireland and Jameson built on this belief by refusing to cut corners on quality products. He built the now-famous Irish whiskey brand from the ground up, selecting the best barley and casks and keeping the entire operation in a single distillery so that quality could be ensured. The result of years of this work has established the brand’s philosophy that remains intact to this day. It continues, not in the Old Jameson Distillery, but in the newer Midleton Distillery nearby. Jameson’s profile reflects its blending techniques of whiskeys aged in various casks including sherry, bourbon, and port and it is these woods that impart the complexity of the whiskey. Jameson holds a sweet fragrance of malted barley with butter tones and subtle oak. The palate is marked by the same, with the grain turning darker and more apparent and notes of spicy nut mixing in and out. It finishes with honey and spicy, smoky snaps of barley that work through the long fade. Jameson is a delightful sipper for the robust whiskey connoisseur and a pleasant cocktail ingredient. Irish Coffee has a wonderful whiskey base, the Leprechaun and Jameson and Ginger become complex, and the creamier Irish Eyes has depth when Jameson is employed. It is, however, not as smooth as other Irish whiskeys, but for the price, reliability, and versatility, that difference is minimal and relatively insignificant. Jameson Gold Reserve is a good introduction into the world of premium Irish blended whiskeys. Jameson Irish whiskey is a popular range of Irish blended whiskeys produced by the Midleton distillery. Jameson Gold Reserve is the first step up from the entry-level Jameson. It provides a slightly stronger alcoholic punch at 43% ABV versus 40% for the rest of the Jameson range. On the nose, this whiskey definitely offers a strong alcoholic punch that can be a surprise for those unused to such strength from a relatively lower proof whiskey. Patience, though, will be rewarded with nice vanilla and oak aromas typical of Irish whiskey. The Gold Reserve has more body than entry-level Jameson and the palate offers notes of malt sugar, oatmeal cookies and warm caramels paired against a pleasant oak tone. The finish is quick and dry, again rather typical for Irish whiskeys. If you enjoy Jameson Irish whiskey, then Jameson Gold Reserve is definitely an Irish whiskey to taste. It bridges the gap between the lower end of the range and the higher end Jameson whiskeys quite well, offering decent value for the price. Jameson 12 year offers notes of pepper and cinnamon to harmonize with oak and vanilla in this great blend. If you are a fan of Irish whiskeys in general or Jameson in particular, Jameson 12-year-old provides an interesting perspective on aged blended whiskeys that you'll enjoy tasting. As the youngest of Jameson age-labeled whiskeys (they also produce an 18 year), the twelve-year offering provides some of the richness and depth of older whiskeys while retaining some of the youthful brightness of younger Jameson offerings. On the nose, Jameson 12 year offers a big rich bouquet of vanilla, oak, and caramels. After it is in the glass for a few minutes, notes of white pepper and dried citrus peel begin to emerge. Jameson 12 is the youngest whiskey in the Jameson line to show a bit of an oily, unctuous mouthfeel versus the light mouthfeel of both Jameson and Jameson Gold Reserve. On the palate, there is a bit of peppery heat evident at the beginning and a certain sourness that some tasters liked and others found unpleasant. Descriptions ranged from lactic acid to sulfur, and one taster, in particular, found this flavor particularly off-putting. Big vanilla, caramel, and oak flavors abound, with orange peel, cinnamon and black tea notes appearing at the end. Jameson 12 year offers a medium length finish, lingering briefly to offer a hint of chocolate, cacao nib, orange marmalade, and tea spice before disappearing. On the whole, Jameson 12 year Irish whiskey is a good introduction into the world of aged blended whiskeys and a must try if you enjoy the Jameson line. Jameson 18 year is a big, mouth coating blend with notes of molasses, caramel, apple pie spice, and umami notes. Jameson 18-year-old Irish whiskey is a great representation of just how good a blended Irish whiskey can be with age. Within the Jameson range, the 18 sits only below Rarest Vintage Reserve and above Jameson, Gold Reserve and 12 year. On the nose, there is a pronounced alcohol sting along with warm notes of vanilla, honey, and caramel. With a bit of time, dried lemon peel, green apple, and cinnamon emerge. Jameson 18 has a big, oily and wonderfully mouth coating body. As it coats the mouth, flavors of caramel, molasses cookies, vanilla, oak, apple pie spice, and umami notes appear. This is a complex and well-made whiskey and it really shows on the palate. The finish on Jameson 18 year is long for a blended Irish whiskey. More oak flavors appear, along with alluring hints of dried fruits and freshly roasted hazelnuts before evaporating off of the tongue, leaving you wanting more and more. Jameson Rarest Vintage Reserve offers an unparalleled taste of just how great the Jameson line can be. A truly classic whiskey. I taste a lot of whiskeys, most of them quite good. Rarely do I taste whiskey as good as Jameson Rarest Vintage Reserve. It's certainly not inexpensive, but then the very best things never are. A blend of whiskeys from 20 to 23 years old aged in port casks this deep gold whiskey offers up one of the finest experiences in Irish whiskey, period. The nose reveals a rich, almost oily aroma with hints of chocolate, leather, dried plum, and toffee. On the palate, a wondrous banquet of lemon curd, malt sugar, honeysuckle, and fresh butter follow hints of umami and surprising tropical fruit notes of pineapple and guava. The finish offers a nutty richness that coats the mouth and lingers for a long time (5 minutes plus). Saddle soap, dried apricots and prunes, dark chocolate and leather notes finish the symphony of flavors. This is not only a great Irish whiskey; it is one of the great whiskeys of the world. Pour a dram of this to celebrate a special occasion or just to make an average night truly special. You won't be disappointed in Jameson Rarest Vintage Reserve; it is my top choice and recommendation. Tullamore Dew vs. Jameson: Which Irish Whiskey Wins the Taste Test?